All of the gods have champions, be them paragons of good or evil, chaos or law. The Constable is a champion of Radiance. These bastions of law uphold the 8 mandates of the Burning Crux unto death. See the Burning Crux organization for further details about the 8 mandates. Adventures: Constables are honored by the duty that Radiance has draped them in, and they take every chance to enforce the churches mandates. They often join groups that seek to further goals in line with the 8 mandates. They almost certainly would consider it an obligation to join any group opposed to Rafar. But for the most part they take their power wherever it is required, or in most cases ordered. Characteristics: .Duty, honor, courage. These things above all else are embedded into the Constable. These champions of law often display militaristic traits and discipline in most facets of their everyday life. If a Constable had a motto it might sound something like “Only lawful behavior creates a society in which people can depend on each other and make the right decisions in full confidence that others will act as they should“. Alignment: Constables are lawful through and through. In fact to be a Constable you must be of lawful alignment. Should a Constable's alignment ever shift from lawful they lose access to all supernatural, spell like and spell casting ability until their alignment returns to lawful. Religion: All Constables pay homage to the god Radiance. All Constables have an affiliation with the church of Radiance, the Burning Crux. See the Burning Crux organization for more details and to calculate your starting affiliation score. Background: Constables at some point in their life feel a calling to service. The most lawful of upbringings and societies usually spawn the most Constables. Many come from military families, town watchmen, retired servicemen and the like. The calling may come at any time and for any reason, but usually involves some situation involving the lack of law. No matter how the path takes them to Radiance the church of the Burning Crux accepts them, trains them, and hones them into the fine instrument of law that is the Constable. Races: The most rigid societies are unsurprisingly the very place you will find Constables. Dwarven communities are usually teeming with Constables. You can often find them as officers in most human armies or serving as town marshals, city guards or as personal body guards for merchants and nobles. Elven communities have the lowest amount of Constables due to the chaotic nature of most elven societies. Other Classes: Constables enjoy other Constables, and anyone else who shows martial skill or a desire to uphold the law. Clerics of Radiance are always welcome allies. They will never associate with chaotic party members associated with the Bedlam Road, and deal with them only with the utmost of caution. Constables have the following game statistics. 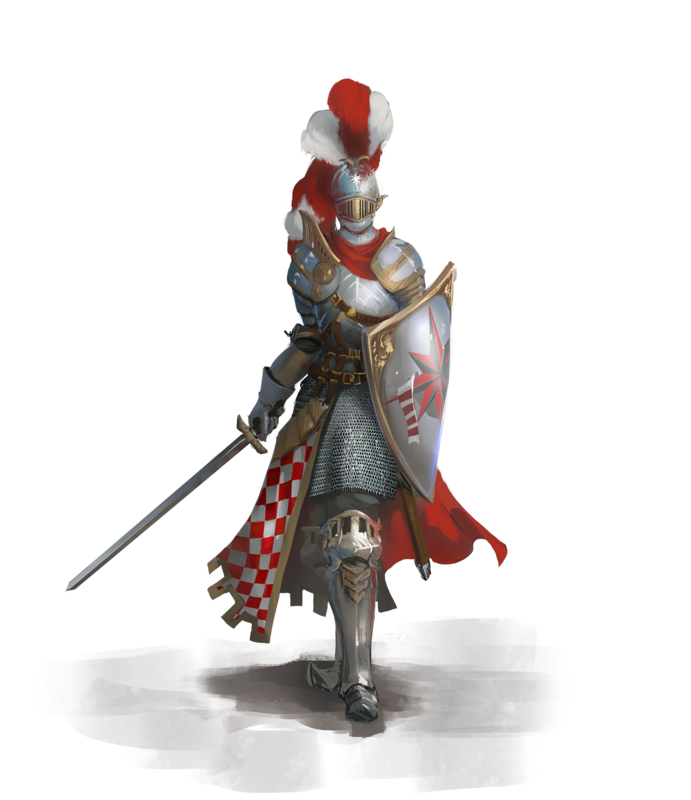 Abilities: As a martial class the Constable benefits well from a high Strength and Constitution score. Most of the Constable’s skills and abilities focus on Charisma, and their spell casting relies on a decent Charisma score. The Constable’s class skills (and the key ability for each skill) are Craft (Int), Diplomacy (Cha), Handle Animal (Cha), Heal (Wis), Knowledge Nobility and Royalty (Int), Knowledge Local (Int), Knowledge Religion (Int), Profession (Wis), Ride (Dex) Sense Motive (Wis) and Spell craft (Int). The Following is a list of class features for the Constable class. Weapon and Armor Proficiency: Constables are proficient with all simple and martial weapons, with all types of armor (heavy, medium and light), and with shields (except tower shields). Aura of Law (Ex): The power of a Constable’s aura of law (see the detect law spell) is equal to their Constable level, just like the aura of a cleric of Radiance. Detect Chaos (Sp): At will, a Constable can use detect chaos as a spell like ability. This ability functions just like the Paladins detect evil class feature. Smite Chaos (Su): One per day, a Constable can call out to the powers of law to aid them in their struggle against chaos. As a swift action, the Constable chooses one target within sight to smite. If this target is chaotic, the Constable adds their charisma bonus (if any) to their attack rolls and adds their Constable level to all damage rolls made against the target of their smite. If the target of the smite is a chaotic outsider with the chaotic subtype, a chaotic aligned dragon, or an undead creature, the bonus to damage on the first successful attack increases to 2 points of damage per Constable level. Regardless of the target, smite chaos attacks automatically bypass any DR the creature may possess. In addition, while smite chaos is in effect, the Constable gains a deflection bonus equal to their charisma modifier (if any) to their AC against attacks made by the target of the smite. If the Constable targets a creature that is not chaotic, the smite is wasted and has no effect. The smite chaos effect remains until the target of the smite is dead or the next time the Constable rests and regains their uses of this ability. At 4th level, and every 3 levels thereafter, the Constable may smite chaos one additional time per day to a maximum of 7 times per day at 19th level. Divine Grace (Su): At 2nd level, a Constable gains a bonus equal to their Charisma bonus (if any) on all saving throws. Alternatively, a Constable can use this ability to deal damage to undead creatures, dealing 1d6 points of damage for every two levels of Constable. Using lay on hands in this way requires a successful melee touch attack and doesn’t provoke an attack of opportunity. Undead do not receive a saving throw against this damage. This is a positive energy effect. Gift of Vellarious (Su): Beginning at 3rd level, a Constable is immune to fear, a Constable also radiates light as per the light spell. The Constable can extinguish the light or reinstate the light as a swift action. In addition a Constable becomes immune to disease, including supernatural and magical diseases. Channel Positive Energy (Su): When a Constable reaches 4th level, they gain the supernatural ability to channel positive energy like a Cleric. Using this ability consumes two uses of their lay on hands ability. A Constable uses their level as their effective Cleric level when channeling positive energy. This is a Charisma-based ability. Spells: Beginning at 4th level, a Constable gains the ability to cast a small number of divine spells which are drawn from the Constable spell list (see below). A Constable must choose and prepare spells in advance like a Cleric. To prepare or cast a spell, a Constable must have a Charisma score equal to at least 10 + the spell level. The Difficulty Class for a saving throw against the Constable’s spell is 10 + the level of the spell + the Constable’s Charisma modifier. Like other spell casters, a Constable can only cast a certain number of spells of each level per day. Their base daily spell allotment is given in the table above. In addition, a Constable receives bonus spells per day if they have a high Charisma score. When the above table indicates that a Constable gets 0 spells per day of a given spell level, they gain only the bonus spells they would be entitled to based on their Charisma score for that spell level. A Constable must spend 1 hour each day in quiet prayer and meditation to regain their daily allotment of spells. A Constable may prepare and cast any spell on the Constable spell list, provided that they can cast spells of that level, but they must choose which spells to prepare during the daily meditation. Through 3rd level, a Constable has no caster level. At 4th level and higher a Constable’s caster level is equal to all class levels in the Constable class -3. Decree (Su): At 3rd level, and every 3 levels thereafter, a Constable can select one decree. Each decree adds an effect to the Constable’s lay on hands ability. Whenever the Constable uses lay on hands to heal damage to one target, the target also receives the additional effects from a single decree possessed by the Constable. If a decree removes a hindering condition or affliction, such conditions return after 1 hour (if not expired) unless the decree removes the affliction that causes the condition. At 15th level the amount of decrees that can be bestowed onto a target is increased to two. At 3rd level, the Constable can select from the following initial decrees. The target gains a +1 divine bonus on attack rolls, this bonus lasts a number of rounds equal to the Constables charisma modifier. This bonus increases to +2 at 12th level. The target gains a +2 divine bonus to either will or fortitude saving throws, chosen at the time the lay on hands ability resolves. This bonus lasts a number of rounds equal to 3 + the Constables charisma modifier. This bonus increases to +4 at 12th level. The target gains a +2 divine bonus on CMB or CMD rolls, this bonus lasts a number of rounds equal to 3 + the Constables charisma modifier. This bonus increases to +3 at 12th level. At 6th level, the Constable can select from the following decrees. The target gains a +1 divine bonus on all damage rolls, this bonus lasts a number of rounds equal to the Constables charisma modifier. This bonus increases to +2 at 12th level. The target gains resistance to fire 5 for a number of rounds equal to 3+ the Constables charisma modifier. This bonus increases to 10 at 12th level. The target emits light, similar to that of a torch, for a number of rounds equal to 3 + the Constables charisma modifier. The target can extinguish the light effect as a free action, however once extinguished it cannot be continued, even if additional rounds of duration remain. At 9th level, the Constable can select from the following decrees. The target gains low light vision for a number of rounds equal to 3+ the Constables charisma modifier. The target’s held weapons gain a minor flaming property, any held weapon or natural weapon the target possesses during the duration of this effect deals an additional 1d4 points of fire damage on each successful hit. This effect lasts a number of rounds equal to the Constables charisma modifier. The fire damage increases to 1d6 at 12th level. This effect does not stack with any flaming ability the weapon may already posses. The target gains a +2 shield bonus to armor class, this effect does not stack with any shield bonus the target may already have. This effect lasts a number of rounds equal to 3+ the Constables charisma modifier. This bonus increases to +4 at 12th level. The targets spells gain a +2 divine bonus on caster level checks to overcome the spell resistance of chaotic aligned creatures. This effect lasts a number of rounds equal to the Constables charisma modifier. The target gains a +5’ bonus to land speed for a number of rounds equal to the Constables charisma modifier. At 12th level, the Constable can select from the following decrees. The target gains temporary hit points equal to the Constables class levels, these temporary hit points last a number of rounds equal to the Constables class levels. The target gains damage reduction 5/chaotic for a number of rounds equal to the Constables charisma modifier. The target gains an immediate attack at its highest attack modifier, similar to the effect of a haste spell, this is a one time effect and it resolves immediately upon completion of the lay on hands ability. The Constable may not use this ability on themselves. The targets weapons automatically overcome the damage reduction of chaotic outsiders for a number of rounds equal to the Constables charisma modifier. Divine Bond (Sp): Upon reaching 5th level, a Constable forms a divine bond with Radiance. This bond can take one of two forms. The first bond allows the Constable to enhance their weapon as a standard action, provided the weapon is a sword of any kind. When called, a celestial spirit enhances the weapon, causing it to shed light as a torch for 1 minute per Constable level. At 5th level, this spirit grants the weapon a +1 bonus. For every three levels beyond 5th, the weapon gains another +1 bonus, to a maximum of +6 at 20th level. These bonuses can be added to the weapon or they can be used to add any of the following weapon properties: axiomatic, brilliant energy, defending, disruption, f laming, f laming burst, keen, merciful, and speed. These bonuses do not stack with any properties the weapon already has. If the weapon is not magical, at least a +1 enhancement bonus must be added before any other abilities can be added. The celestial spirit imparts no bonuses if the weapon is held by anyone other than the Constable, but resumes giving bonuses if returned to the Constable. A Constable can use this ability once per day at 5th level, and one additional time per day for every four levels beyond 5th, to a total of four times per day at 17th level. If a weapon bearing a celestial spirit is destroyed, the Constable loses the use of this ability for 30 days, or until they gain a level, whichever comes first. During this 30-day period, the Constable takes a –1 penalty on attack and weapon damage rolls. The second bond allows a Constable to gain the service of an unusually intelligent, strong, and loyal steed to serve them in her crusade against chaos. This mount is usually a heavy warhorse (for a Medium Constable) or a warpony (for a Small Constable). Once per day, as a full-round action, a Constable may magically call their mount from the Fields of Valor in which it resides. This ability is the equivalent of a spell of a level equal to one-third the Constable’s level. The mount immediately appears adjacent to the Constable and remains for 2 hours per Constable level; it may be dismissed at any time as a free action. The mount is the same creature each time it is summoned, though the Constable may release a particular mount from service. At 11th level, the mount gains the celestial template (see the Pathfinder Bestiary) and becomes a magical beast for the purposes of determining which spells affect it. At 15th level the mount gains spell resistance equal to the Constables level +11. Should the Constable’s mount die, it immediately disappears, leaving behind any equipment it was carrying. The Constable may not summon another mount for 30 days or until they gain a Constable level, whichever comes first, even if the mount is somehow returned from the dead. During this 30-day period, the Constable takes a –1 penalty on attack and weapon damage rolls. Aura of Resolve (Su): At 8th level, a Constable is immune to charm spells and spell-like abilities. Each ally within 10 feet of them gains a +4 morale bonus on saving throws against charm effects. This ability functions while the Constable is conscious, but not if she is unconscious or dead. Aura of Justice (Su): At 11th level, a Constable can expend two uses of their smite chaos ability to grant the ability to smite chaos to all allies within 10 feet, using the Constable’s bonuses. Allies must use this smite chaos ability by the start of the Constable’s next turn. Using this ability is a free action. Chaotic creatures gain no benefit from this ability. Aura of Faith (Su): At 14th level, a Constable’s weapons are treated as lawful aligned for the purposes of overcoming damage reduction. Any attack made against an enemy within 10 feet of them is treated as lawful aligned for the purposes of overcoming damage reduction. This ability functions while the Constable is conscious, but not if they are unconscious or dead. Aura of Righteousness (Su): At 17th level, a Constable gains DR 5/chaotic and immunity to compulsion spells and spell-like abilities. Each ally within 10 feet of them gains a +4 morale bonus on saving throws against compulsion effects. Champion of Radiance (Su): At 20th level, a Constable becomes a conduit for the power for Radiance. Their DR increases to 10/chaotic. Whenever they use smite chaos against an chaotic outsider, the outsider is also subject to a banishment, using their Constable level as the caster level (their weapon and holy symbol automatically count as objects that the subject hates). In addition, whenever they channel positive energy, they channel the maximum possible amount. Lawbound: A Constable is Lawbound to whatever laws are in place. This means if a Constable knowingly breaks the law of the land they lose all Constable class abilities until they atone, see Ex - Constables below. Associates: While a Constable may travel with anyone of a good, evil or neutral alignment, they will never knowingly associate with chaotic characters associated with the Bedlam Road organization, nor will they continue association with someone who knowingly disobeys the law of the land or the 8 Mandates of the Burning Crux. A Constable who ceases to be Lawful, breaks the law intentionally or knowingly associates with chaotic characters associated with the Bedlam Road loses all Constable spells and abilities ( including the service of the Constable’s special mount, but not weapon, armor and shield proficiencies ). They may not progress any farther in levels as a Constables. They regain their abilities and advancement potential if they atone for their violations (see the atonement spell description), as appropriate. Level 1: Bless, Axiomatic Water, Cure Light Wounds, Detect Poison, Divine Favor, Endure Elements, Light, Magic Weapon, Protection from Chaos, Read Magic, Resistance, Restoration ( Lesser ), Virtue Level 2: Bull‘s Strength, Delay Poison, Eagle‘s Splendor, Owl‘s Wisdom, Remove Paralysis, Resist Energy, Shield Other, Undetectable Alignment, Zone of Truth, Level 3: Cure Moderate Wounds, Daylight, Discern Lies, Dispel Magic, Heal Mount, Magic Circle Against Chaos, Magic Weapon ( Greater ), Prayer, Remove Blindness/Deafness, Remove Curse, Searing Light. Level 4: Axiomatic Sword (as Holy Sword except lawful aligned dealing an additional 2d6 against chaotic creatures and with a magic circle against chaos effect), Break Enchantment, Cure Serious Wounds, Death Ward, Dispel Chaos, Mark of Justice, Neutralize Poison, Restoration.